Armstrong logo carved in stone. 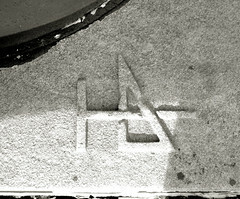 A detail of Harris Armstrong's t-square and triangle logo carved into a stone column base at the Magic Chef Building (1947). Armstrong designed the building for the American Stove Company as their national headquarters. Today, the building is used as a U-Haul storage facility. Most of the facades have been encased in corrugated metal siding). I ran across the post and commentary here on St. Louis's "Magic Chef" Building, built in 1947 by architect Harris Armstrong and it's Isamu Noguchi ceiling. I appreciate the information, discussion and data you have gathered and the respect paid to what has always been one of my favorite, albeit the most sadly misused, buildings in the St. Louis area. Having grown up practically in the shadow of Mr. Armstrong's work, I've spent most of my career contemplating it each time I drove by, always dreaming of a time when it could once again function nearer to it's designed intent. I recently devoted bit of free time to working up a conceptual rescue, restoration and reuse design.